Soundstreams and Maniac Star are presenting the world premiere of the hour-long opera Airline Icarus by composer Brian Current to a libretto by Anton Piatigorsky. Since the duo have already laboured nearly thirteen years to bring the opera to a fully staged performance, they will probably not be happy to think that the opera still needs more work to fulfill its potential. Yet, that is the case. Current’s shimmering, rhythmic music is beautiful, but Piatigorsky needs to flesh out the characters and the story. That done, the two might have a longer opera with greater appeal to other opera companies. The opera follows a commercial flight on “Current Air” from an unnamed city to Cleveland, Ohio. There are six characters, two sung by the same soloist, and a chorus of six (Dawn Bailey, Sean Clark, Larissa Koniuk, David Roth, Zorana Sadiq and Jennifer Taverner). The characters are a Worker whom we see as a baggage handler (Alexander Dobson), the Pilot (also Dobson), the Flight Attendant (Krisztina Szabó) and three passengers – a Business Man (Geoffrey Sirett, an Ad Executive (Vania Chan) and a Scholar (Graham Thomson). It is not clear who precisely the Chorus is, though ghosts of travellers past seems to make the most sense. We watch the flight from the boarding and loading of luggage, through the safety announcements and take-off to – well, unfortunately, it is hard to say to what. The writer of the programme note quotes the creators as saying, “Over the course of the work, the plane becomes brighter and eventually vanishes”. Yet, Piatigorsky’s libretto says in the stage directions for the final scene, “They return to their seats. The plane is still flying. The turbulence passes”. The way director Tim Albery stages the last minutes of the opera, with the contents of the luggage strewn all over the playing area looks, like a lot worse than turbulence and even if it is only turbulence it does not seem to pass. This doubt about the ending is the main factor that makes the work seem unfinished. The opera ends in mid-flight, figuratively and literally, and we don’t know why. In its present form the opera has more the effect of a staged oratorio for chorus and two voices – baritone (Worker/Pilot) and tenor (Scholar) – than an opera because Piatigorsky elaborates his themes only through these two leaving the other characters underdeveloped. Piatigorsky uses the baritone to present two sides to air travel from a technical point of view and the tenor to place air travel in a mythological context. The Worker loading the luggage notes that air travellers are basically trusting lives to flying in what amounts to a gigantic bomb ready to explode. The Pilot, in contrast, extols the wonder of man’s ingenuity in being able to sail among the clouds. The Scholar is on his way to a conference to give his first professional paper comparing Ovid’s and Apollodorus’ accounts of the Icarus myth. He sings, “Both write of Daedalus / And his son Icarus / Who died of hubris / Ascending”. At this point it would be very useful to have the Scholar tell us in greater detail about the myth because the story makes two points. Master inventor Daedalus, who built the labyrinth in Crete to keep the Minotaur trapped, was imprisoned in the same labyrinth with his son Icarus. Daedauls built wings of wax so that he and Icarus could escape. Daedalus told Icarus that the wings would not work if he flew too low to the damp sea or too high toward the hot sun. While Daedalus took the middle way that he advised and landed safely in Sicily, Icarus grew so excited with his ability to fly he flew too near the sun, the wax melted and he plunged to his death in the sea. Icarus’ story ever since has been a symbol of man’s hubris and how that hubris leads to a fall. The other side of the story, that Piatigorsky neglects, is that Daedalus’ safe journey demonstrates the “via media” or virtue of moderation in all things. The motto in ancient Greek inscribed on the Temple at Delphi is “μηδὲν ἄγαν” or “Nothing in excess”. Piatigorsky has the Scholar take the stereotypic Luddite view of a humanities professor that man’s progress via technology is dangerous. Instead, he could have had the Scholar draw on the same classical sources to arrive at a subtler, more moderate view. In focussing so much on the Worker/Pilot and the Scholar, Piatigorsky leaves little for the other characters to do. He chooses a simple one-way pattern of unrequited love where the Flight Attendant falls for the Business Man who falls for the Ad Executive who falls for the Scholar. If we are to be interested in them Piatigorsky should give us something more than this creaky plot device. Dobson and Thomson have so much to sing, it would not go amiss to hear more about how the other three characters view flying. Reich, especially his “Desert Music”; his lyric flights are reminiscent of John Adams’ operas and his fascination with bright orchestral textures recall György Ligeti. The extended arias he gives the Worker/Pilot allow Dobson to display the richness and strength of his lush baritone and those he gives the Scholar give Thomson the chance to explore different sides of his character by shading his appealing English-style tenor. While the other characters have only snippets of phrases, all well performed, what is most engaging are the many choral passages and their frequent use of precisely executed glissandi. 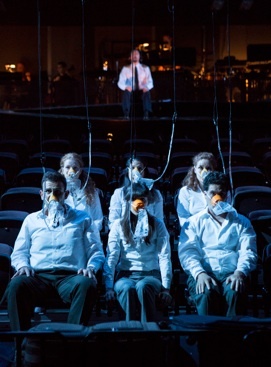 In one imaginative passage the oxygen masks drop down, the chorus puts them on and Current makes creative use of reverb effects caused by mics hidden in the masks. Designer Teresa Przybylski has made excellent use of the large Ada Slaight Hall in Daniels Spectrum. The seating is divided into two facing halves, one representing the airplane, one for the audience. The set-up implies that what happens on the staged half of the seating reflects the reality of the other half. Two abstract wings separate the oversized “cabin” of the plane from the nine-member orchestra above. The middle of the wings is where the Pilot sits. The three passengers, although theoretically adjacent to each other are placed with the men at either end of a seating row with Vania Chan in the middle several seats away from both. Once the idea of the cabin is established, director Tim Albery allows the three to move about, their physical closeness becoming a metaphor for their desired emotional closeness. The chorus is free to roam as a group about the cabin “haunting” as it seems whomever it chooses. In a passage at the climax of the turbulence, very effectively suggested by the sudden controlled chaos of Kimberly Purtell’s lighting, the cast flees the cabin to seek refuge in the aisles of the audience side, as if the thought of impending doom had caused them to feel like spectators of their own lives. The music is so exciting and the staging so well conceived, one simply wanted the libretto to be clearer about how the flight ends and to explore further the implications of its premise. The fact that a more detailed libretto would mean more music from Brian Current would only add to the opera’s appeal. Photos: (from top) Graham Thomson as the Scholar with the Chorus; Alexander Dobson (in background) with the Chorus. ©2014 Cylla von Tiedemann.